PLEASE press "CONTACT OWNER" for DISCOUNT RATES for extended stays. This is a Premium Ground Floor - End Unit. That means lots of windows and two lanais that open out to the lush tropical grounds - bringing the outside in. 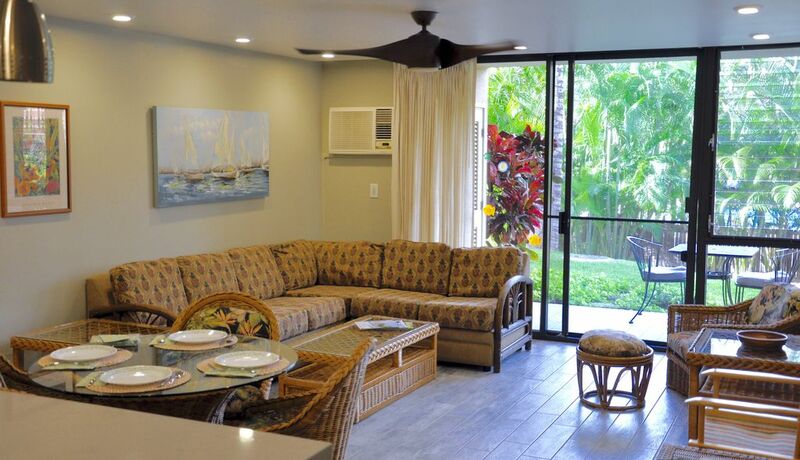 You will not be disappointed with the bright and open floor plan of our condominium and its location nestled within the tropical gardens of Kamaole Sands Resort. Its three large bedrooms, two full baths, two private lanais, fully equipped kitchen, and large living room are all about a beach inspired vacation. From our beach inspired space, you step out to the lush tropical gardens and green expansive lawns of Kamaole Sands Resort. As our guests, you have full use and access to the pool deck and swimming pool, with separate children's pool, two Jacuzzis, lounge chairs, and tables with umbrellas. The fitness room, and open-air recreation room, equipped with a ping-pong table, board games, and lending library is located at the pool deck for guest use during regular pool hours. Eight barbecue areas located within the gardens come equipped with 16 self-starting gas grills, picnic tables, and plenty of seating. The beautiful and well maintained tennis courts are open from dawn to dusk daily. Just a short walk through the beautiful gardens to the 'BEST' rated boogie board beach on Maui as featured in Sunset Magazine, California's highly regarded home and garden magazine. 'Kam Three Beach' is a fantastic beach for swimming of all ages and abilities, boogie boarding, snorkeling, sunbathing, whale watching, tide pool exploration, and spectacular sunsets. Kamaole III park opens onto the beach from its shady bluff for easy access to the sand and ocean. The beach has a lifeguard station staffed with certified lifeguards on duty daily. Conveniently located just a few steps from our lanai is an outdoor shower for rinsing off sandy feet, sand toys, and beach equipment after a day at the beach. Our fully equipped KITCHEN overlooks the open and spacious dining area and living room. Amenities include a refrigerator with ice-maker, electric stove and oven, dishwasher, microwave, disposal, coffee maker, teakettle, toaster, blender, hand mixer, serving trays, BBQ utensils, cutting boards, corkscrews, water pitchers, pots and pans, cookie sheets, and mixing bowls. The LIVING ROOM features a large 50" screen television and High speed WIFI internet . Our fantastically comfortable sectional sofa with its queen size pullout bed, provide plenty of seating in the living room. The BEDROOMS have Serta plush hotel quality beds, ceiling fans, large windows and tropical Hawaiian colors and decor. The 'LANAI' BEDROOM opens out to a private lanai from its full length, floor to ceiling window and screened sliding glass door. A second window in this bedroom opens to let the cooling Maui trade winds flow through in the afternoon. All new Hawaiian design furniture includes a dresser and mirror, and bedside tables. Also it has a large flat panel TV for your enjoyment. The 3rd BEDROOM is a favorite of ours and of other Kam Sands owners who often come through to see our latest decorating additions. This is a spacious and 'kid' friendly room with Serta Plush twin beds, high vaulted ceiling, east-facing window that opens to reveal the beautiful Maui morning sun, and west-facing window that allows the cool afternoon trade winds in. . Framed art - bright and whimsical, features local Maui artists -- this is a great room for rest or play. This bedroom also has a wall mounted flat panel TV with remote (DVD player only, cable not available in this room). The 'MASTER' BEDROOM has a full-length window with custom made and professionally installed plantation shutters that run the entire width of the room, providing privacy while still allowing lots of light and the cooling afternoon breeze in. An ensuite full size bathroom, Flat panel TV with remote, rattan bedroom furniture, and tropical design bed ensemble gives this room its own unique feel. We completely transformed the two full size bathrooms. Everything from floor to ceiling - wall to wall - is Brand New!! Wait until you feel the pebbled tiles underfoot when you step into the showers! We transformed our bathrooms, upgraded and remodeled featuring floor to ceiling tiled showers. The enlarged shower in the master bath has room enough for two inside the beautiful tile enclosure that runs the length of the bathroom. Both bathrooms have large and roomy counter tops along with plenty of storage space to accommodate everyone's personal toiletries. The LAUNDRY area has a large capacity washer/dryer. A supply of laundry soap, iron and ironing board, vacuum cleaner, broom/dustpan, floor mop, and basic cleaning supplies are all provided. Beach chairs and umbrella, beach toys and other beach gear and equipment donated by our many generous guests over the years are here for your use; however, the inventory of items can vary. Beach toys are kept in the storage bench on the lanai. Baby cribs, high chairs, strollers, car seats, etc. are available to rent from a local rental company in Kihei. We recommend reserving baby equipment prior to your arrival. We can provide website links if requested. Golf (2-minute drive to Wailea golf courses), whale watching, snorkeling, surfing, boat cruises, theater, cafes, restaurants, bicycling, hiking, shopping, and all the best beaches are close, many within walking distance. Reserved parking for our guests has a wheelchair ramp and is located next to the condominium. We provide free local phone service and free plug & play internet access. Twenty years ago Carl came to Maui for two weeks of Windsurfing, Windsurfing and more Windsurfing. Karen came to Maui twenty years ago for vacation and stayed at Kamaole Sands in a ground floor unit in building 7. Karen fell in love with Kamaole Sands. Carl was in love with Windsurfing. The two of them were both happily single. When it was time to go home, Carl arrived at the Kahului Airport and decided to take an earlier stand-by flight over to Oahu to catch his connecting flight home to the mainland. Karen arrived at the Kahului Airport for her return trip home to the mainland that same day - relaxed and looking forward to an easy day of travel. She arrived at the gate for the flight to Oahu way ahead of time so she kicked off her shoes and settled in with a good book. An announcement for an available seat on a flight leaving for Oahu "right now" was made. It was announced 3 or 4 more times before the last and final "one seat left - plane door is closing." Karen says she has no idea why she decided at the very last second to get on that flight... only that it changed her life. She sat in the only seat available - the middle seat in the very last row. Carl was seated next to the window. Karen fell in love with Kamaole Sands the first time she stayed at Kamaole Sands over 20 years ago. She met Carl who loved Windsurfing. Karen and Carl fell in love. Soon thereafter they came to Kamaole Sands together and felt the love. They are very grateful to have such a beautiful space here on Maui and want to ensure that others traveling to Maui that stay in their home walk through the front door and say... "wow... this is incredible, we love it!" Very clean, very conveniently located condo! We really enjoyed our stay here. We stayed here in Feb with 3 adults, one 2 year old and a 4 month old. It was Perfect for our family. It was clean, well maintained and nicely updated. The condo had plenty of space, all 3 bedrooms were a good size (easily fit a pack n play), kitchen and common area were also spacious. The ground floor unit was perfect for toddlers and strollers. The location of Kamaole Sands is right across the street from the beach (about a 5 minute walk with a toddler) and Kamaole Beach 3 was about a 15 minute walk. The condo is also within 30 steps of the pool. The kitchen was well stocked with everything we needed (only missing a teapot). Great selection of beach toys, towels, boogie boards, chairs and umbrellas. Owners were easy to communicate with and very quick to respond. Would highly recommend this condo/resort. Hopefully we will be staying here again in the future. We stayed here in January 2019 for 11 days. This newly renovated condo was prefect for our needs We are a family of 5 with 3 kids ages 2.5, 5, & 6.5 years. There was somewhere for everyone to sleep, tvs access in every room (even Dora dvd's for my Dora loving kid), and plenty of room so you didn't feel crowded. Both of the remodeled bathrooms are beautiful. There was just a couple of times that I wished I had a bathtub. The close proximity to the pool was great so we could see if it was too busy to head down. The one downfall with that is the pool is open until 10pm so some nights can be noisy. The beach is just across the street and everything that you need to enjoy it is supplied. There is a big outdoor bench filled with beach-toys, my kids loved it. The outdoor shower is just by the pool gate so you can rinse off after the beach. Being on ground floor also has a benefit that kids can play on the grass and you can watch them . I would stay in this condo again, Karen and Carl were great to work with and help make your vacation memorable right from the start. Perfect condo for three generations! This condo is in a beautiful complex in Kihea. All of the common areas are very well maintained. There is plenty of room inside the condo in the living and bedroom areas. Although it was humid when we were there, the overhead fans kept the rooms cool, and at night, we were able to get plenty of ventilation from the outside air. Washer/dryer was a plus. There is a grassy area right outside the condo on which my grandson could play games and just beyond, the pool. It was a short walk to the beach, the turtles and several trails. The back bedroom does get some parking lot/sidewalk noise, but I was the only one who heard it during the night. I would highly recommend this unit. Outstanding place from which to see all! We visited in August 2018 with our 2 daughters and a niece. This place is awesome! 3 bedrooms 2 full baths. It comes with virtually everything you'll need to relax, visit any number of perfect beaches, read a book, nap, eat, or whatever! Guaranteed to make your stay blissful. And, whoever is cleaning this place deserves a gold star - spotless! A special thank you to the owners for quick responses and for doing such a great job on the renovation. I kept thinking Hmm I'd like to use these ideas on my house! Mahalo Carl and Karen for an amazing stay in Maui. Great location! Close to the beaches that are perfect for chilling and snorkeling. Beautiful updated kitchen. Condo is literally across from the pool. All beach gear available for use. Perfect for three couples. PLEASE EMAIL us about our REDUCED RATES for extended stays. Discounts for extended stays or low season will be quoted on an individual basis, please email us for your personal quote. Holiday, high season periods or shorter stays may be higher. Daily rate does not include taxes.